Scientists use sophisticated optical techniques to peer into the brains of rodents learning an association for a better understanding of how animals learn. The brain has, for long, been reluctant to share its secrets. One such secret is how a complex cognitive function like learning can emerge from its mysterious alleyways. Researchers from the National Centre for Biological Sciences (NCBS), Bangalore, peered into the social lives of neurons deep inside the brain to unravel the neural roots of a kind of learning ubiquitous among animals, including humans–associative learning. The most well known example of associative learning was demonstrated by Pavlov’s dog, which learned to associate food with the ring of a bell when they were repeatedly presented together. Eventually, the dog salivated merely at the ring of the bell even in the absence of food. The neural basis of this phenomenon is well understood. It occurs by means of Hebbian plasticity, a physiological mechanism best paraphrased as “neurons that fire together, wire together”. But many animals also learn to associate stimuli even if they are separated in time. How the representation of one stimulus is maintained in the brain until the other arrives has not been established. Two models have been proposed to explain the neural underpinnings of this form of learning. The first suggests that the neurons that are excited by a stimulus keep firing until the second stimulus arrives. The second model argues that different groups of neurons fire sequentially in the interval between the two stimuli. Researchers led by Upinder Bhalla at NCBS took it upon themselves to investigate the claims of each of these models in mice. 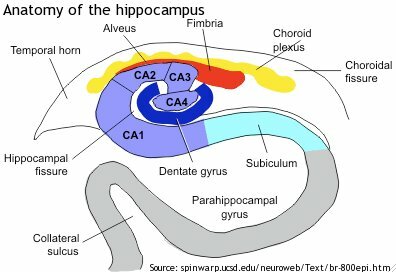 They focused their attention on a region called CA1 in the seahorse-shaped hippocampus, lying deep inside the brain, which has been implicated in the formation of memories and retention of stimuli. Mice in Bhalla’s lab were played a tone through loudspeakers. After a short delay, a puff of air was blown into their faces, causing them to blink. Following repeated exposures to these non-overlapping stimuli, many of these mice blinked in response to the tone alone, thus learning to associate the two stimuli–the tone and the puff of air. As the animals were experiencing the stimuli, the researchers monitored the behavior of populations of neurons from the CA1 region using a technique known as two photon calcium imaging. A few hours before exposing the mice to the stimuli, they anaesthetized them and injected a fluorescent indicator of calcium through a tiny hole drilled into the hippocampus. They also implanted a transparent gel covered with glass. Using a microscope, they were now able to “see” populations of neurons in action—when the neurons fired, there was an influx of calcium ions into the cells, causing the calcium indicator to fluoresce. “Ours is only the third group in the world to optically record from populations of the hippocampal neuron”, says Mehrab Modi, the first author of the study, referring to the challenge of studying the social behaviour of neurons from this region of the brain. Their experiments showed clearly that as the rodents learned the task, the sound of the tone caused distinct groups of neurons to fire one after the other, in a reliable, time-locked fashion, until the puff of air arrived. The reliability increased over the training session. Moreover, the organized firing of groups of neurons was only seen in the mice that learned the association successfully. The results unequivocally support the “sequential-firing” model. Explaining the significance of the study, an excited Bhalla says, “The sequential activation of neurons could be a default mechanism for learning.” This mechanism could, therefore, be a neural template for our understanding of how animals learn, a central problem of modern neuroscience, according to Modi.